Ipanema has created world-class restaurants, shops, and cafes. At the forefront of the beach culture are the many surfers and sun worshippers who socialize daily at the beach. Every Sunday, the roadway closest to the beach is closed to motor vehicles and local residents and tourists use the opportunity to ride bikes, roller skate, skateboard and walk along the ocean. Ipanema holds its own street parade during Carnival festivities, and the Banda de Ipanema attracts up to 50,000 people to the streets of Ipanema for Carnival. we couldn't have asked for a better apartment. The apartment had a 24-hour doorman, always leaving us feeling very secure and taken care of. The apartment itself was clean, sleek and modern. The rooms were perfect for 6 people, and we had a lot of closet space for our luggage. The kitchen was modern with new appliances and a washer and dryer which was key since we were halfway through our trip in Brazil. The apartment was outfitted with all the comforts of home, and we only wish that we had been able to stay longer to enjoy the apartment and the neighborhood. Chad was also great to work with. He always made himself available to answer any questions we had and was completely flexible with meeting us upon check-in and check-out. 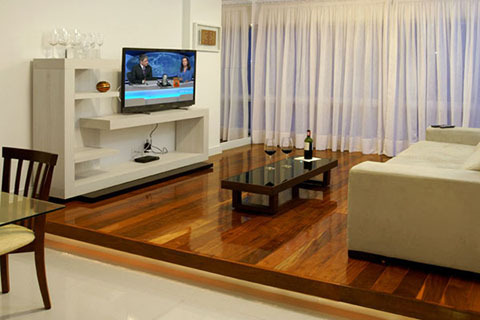 I would definitely stay in this apartment again and recommend this service for anyone looking to stay in Rio.